On a scale of Live Under Par to 10, I’d give the LPGA’s new campaign a 5. It feels a bit dark but understandably serious given the issues motivating the “Drive On” slogan. In the initial roll-out, Drive On is followed by “This is for every girl” in the first phase of the campaign. I’m not sure how much an empty-sounding phrase needing another catch phrase to explain puts people in the seats, but that’s the view of players, notes GolfChannel.com’s Randall Mell. The launch video and styling feel incredibly familiar, but I can’t quite place where I’ve seen this style of ad before other than to know we’ve all seen something like it before. Not that there’s anything wrong with that! I’m not sure why the concept of Q-School has drifted so far. At one times tours had a season-ending tournament where players shooting the lowest score got a card for the following year. Sometimes it took a few stages and some terrible stress to get there, but it all worked pretty well. We know by now how the PGA Tour has turned their legendary Q-School into a Web.com Tour field filler, and this year it was the LPGA Tour’s turn to make everyone scratch their heads with exemptions for college players. Seven of the eight amateurs who qualified for the eight-round finals earned full status for 2019, meaning they will skip the spring. With the top five women in the Golfweek/Sagarin College Rankings given an opportunity, their likely imminent departures will be a tough blow for college golf and not necessarily the way to run a Q-School. At least one player—naturally a Bruin—was not comfortable with the effort to expedite pro careers. “You’re kind of making the decision for them,” said Kristy McPherson, a South Carolina grad and LPGA veteran who earned back her card at this week’s Q-Series. UCLA’s Patty Tavatanakit (above) was in the running for College Player of the Year last year as a freshman. She actually hesitated in coming to Pinehurst at all for Q-Series. “My heart and soul was not in this tournament,” said Tavatanakit, who told her dad as much after the third round. And now there is the headline-making story of a player’s mother spotted moving a ball from out-of-bounds to in-bounds. Randall Mell on the DQ of Doris Chen, the 2014 NCAA Champion. That all said, there were success stories noted here by Golf World’s Ryan Herrington. Some birthday week eh, @xanderschauffele? Cameron Champ has arrived, taking the Sanderson Farms and a fantastic bookend for his coffee table book collection. Nelly Korda becomes an LPGA winner in Taiwan and has a fantastic glass plate to show for her effort. #LPGAWinnerSelfie with @nellykorda at the #SwingingSkirts LPGA Taiwan Championship- the first winner selfie of her young career! Scott Parel won the Invesco QQQ and the member-guest crystal that goes with winning a Schwab Cup playoff event. This week’s friendly (cautionary) tale for a world of golf eager to cash in on all things golf in China comes in the form of a Reuters report by Peter Reynolds. The short version: sources say someone “high up” in China urged the golfers to pass on this week’s Swinging Skirts LPGA Taiwan Championship. Shanshan Feng and rookie Yu Liu are the two players, both given billing on tournament websites. Reynolds quotes Liu as saying the late WD was not for personal reasons. Maybe they heard the early week discussion about what an awful year Americans were having on the LPGA Tour, because six Americans finished inside the top nine of the Evian Championship, led by the feel-good story of long time major contender Angela Stanford. A pair of weekend 68s and a rough finish from Amy Olson allowed Stanford to become the second oldest player to win an LPGA major. She became the second-oldest player in LPGA history to win her first major, behind Fay Crocker, who won the 1955 U.S. Women’s Open at 40 years, 11 months. Stanford turns 41 on Nov. 28. “I have no idea what just happened,” said Stanford through heavy tears after her win at Evian-les-Bains, France. Sexism Alive And Well Files: "If a No. 1 player can’t get replacement clubs after a long and successful relationship, what kind of message does that send to up-and-comers?" Forgive me for not seeing Beth Ann Nichols' Golfweek story from two weeks ago, but Bellerive had that kind of transitory effect. Anyway, we discussed on the latest State of The Game the absurdity of this story. Given the amount of free stuff given to young male golfers--young being 14 and up--the notion that a company said no to a future Hall of Famer, all-time great and player who actually might influence buying habits, I'm not sure if there is any way to defend the actions of Taylor Made as they relate to Inbee Park. Two months ago, when Inbee Park was No. 1, caddie Brad Beecher reached out to a TaylorMade rep on behalf of Park to get replacements for the 3-wood, 5-wood and two Rescue clubs she had in her bag. Park is a Srixon staff player but is only required to have nine Srixon clubs in the bag. For more than five years she has played with four TaylorMade woods. That timespan includes six of her seven majors, an Olympic gold medal and more than 100 weeks as the No. 1 player in the world. Park received the same response as several other LPGAers: A new company policy stipulates that players must use a TaylorMade driver to get free product. Anyone who has seen Park play in person is immediately struck by how well she plays her fairway woods to make up for less length off the tee. Next, you are struck by how beloved she is with Korean golf fans. One might think this would lead to companies lining up to stock her locker with fairway woods. All in hopes of being associated with an all time great and the strongest part of her game, driver counts be damned. It's a rare misstep from a player-friendly company and one that sadly screams of short-sightedness at best, whiffs of sexism at the very least. Lexi Thompson is back on the LPGA Tour after taking a short leave to get refreshed and to gather her thoughts after a rough 2017. And she's back to bad luck on the rules infraction side of things, though this one is most definitely on her shoulders. Kevin Casey explains why her taking lift, clean and place relief caused the infraction. Great to see so many people enjoying the final 2018 links season tournament despite no Americans in contention and two little-known leaders in Georgia Hall and Pornanong Phatlum. ORLANDO, Fla., (Aug. 10, 2018) – Sunday’s final round of the Ricoh Women’s British Open on NBC delivered 964,000 average viewers (11:30 a.m.-2 p.m. 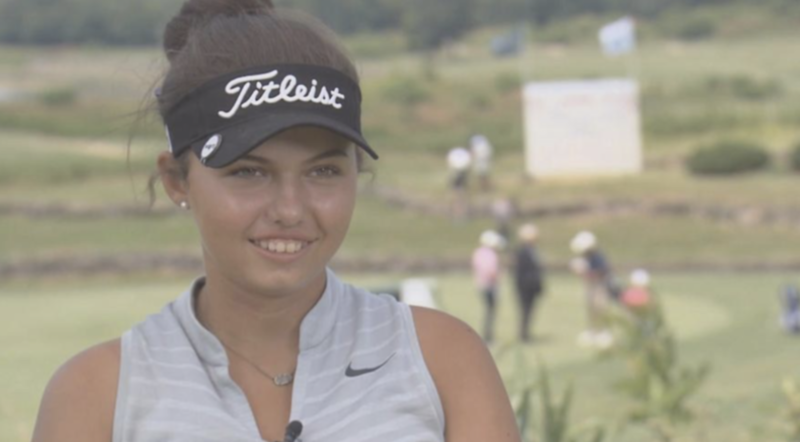 ET; P2+), which saw Georgia Hall become the first Englishwoman since Karen Stupples in 2004 to win the Ricoh Women’s British Open with a two-shot victory over Thailand’s Pornanong Phatlum. This makes The 2018 Ricoh Women’s British Open final round the most-watched women’s golf telecast on any network in 2018 and most-watched final-round telecast since last year’s Ricoh Women’s British Open final round, also on NBC (1.1 million average viewers). Sunday’s final round also becomes the 2nd most-watched final round at this event since 2009 on ABC. Saturday’s viewership on NBC also becomes the most-watched women’s golf Saturday telecast on any network in 2018 with 740,000 average viewers. Saturday’s coverage also becomes the 2nd most-watched third round at this event in 10 years, since 2008 on ABC. NBC Sports’ combined weekend coverage (.63 U.S. Household Rating, 842,000 average viewers) becomes the 2nd most-watched weekend at this event in nine years, since 2009 on ABC and behind only last year’s coverage on NBC. NBC Sports’ final round linear coverage peaked at a .85 U.S. Household Rating, and 1.18 million average viewers (1:45-2 p.m. ET). Digital: Across four days of coverage, 2.2 million total minutes were streamed (+10% vs. 2017); making 2018 the most-streamed women’s golf event ever across NBC Sports’ platforms. While Joanne Carner won't find it too funny, the USGA wisely had an equipment specialist at this week's U.S. Senior Women's Open registration just in case some of the legends showed up with clubs which, shall we say, haven't been seen in these parts for some time. They've tested 20 clubs, with seven being deemed non-conforming, most likely due to worn grooves. As Beth Ann Nichols writes for Golfweek, Joanne Carner has had to scramble to find a new wedge for her Chicago Golf Club scrambling. Carner turned up at the Open with a Wilson R90 sand wedge from her heyday that probably lacked conforming grooves on the face. “Oh, it was awful,” said Carner of parting with a club that’s been critical to her game around the greens and from 75 yards out for so many years. It felt like parting with an old friend. When head pro John Guyton got wind of Carner’s predicament, he pulled out the wedges that had been cleared away from the pro shop to make room for championship merchandise and presented them to Carner. The 79-year-old legend whittled it down to two wedges, and Guyton adjusted both to match the loft and lie of old faithful. Guyton had the clubs out to Carner before she’d even reached the first green of her practice round. She wound up choosing a Titleist Vokey 54-degree wedge that was bent to 55. What an impressive win by Francesco Molinari to take the Quicken Loans National by eight over Ryan Armour. He was joined by tournament host Tiger Woods to hoist one of the best trophies in golf, and possibly the last one to be given out. Dan Kilbridge on the 35-year-old's win and the first on the PGA Tour by an Italian born player since Tony Penna. Someone at the LPGA Tour must be low on Titleist's, with a double mention to our friends in Fairhaven upon Sung Hyun Park winning the KPMG LPGA Championship in a playoff over Soyeon Ryu. Beth Ann Nichols with the Golfweek game story on changes the 24-year-old made this week to help improve her putting and win a major. David Toms held off a strong contingent of pursuers to win his first U.S. Senior Open, as this AP game story explains. Alex Noren will have plenty of good vibes for the this fall's Ryder Cup after winning the HNA French Open at Le Golf Nationale where the matches will be played. Alistair Tait explains how the Swede came from seven back to win his 10th European Tour title. I'm fairly certainly a Saturday in the summertime is the only opportunity more likely to get something less notice than a Friday evening in summertime. As Kevin Casey notes for Golfweek, this is the second joint KPMG LPGA and PGA Championship site announcement and great news for the women, who will return to a former U.S. Women's Open site and scene of many fine championships.